The Minister of Works and Transport, Monica Ntege Azuba says government decided to revive the national carrier, Uganda Airlinea after nearly 20 years upon realization that the foreign airlines which operate in Uganda “are not fully dependable”. 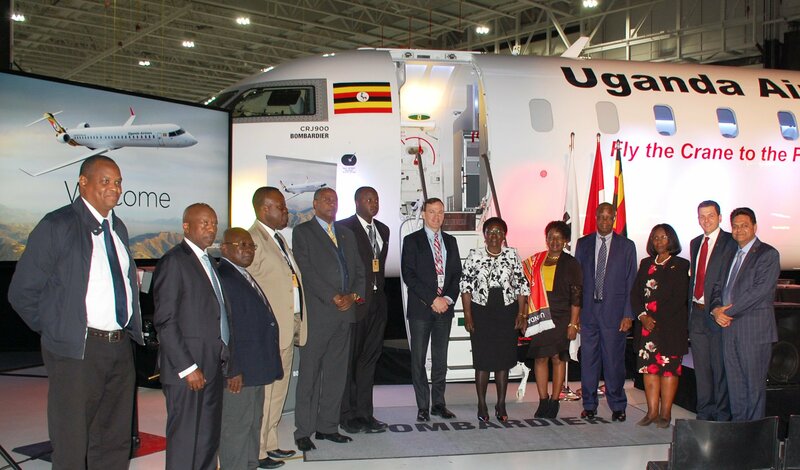 The Minister was Tuesday speaking at an event organized by airlines company, Bombardier in Canada, to handover the first Bombardier CRJ900 aircraft purchased by government of Uganda. 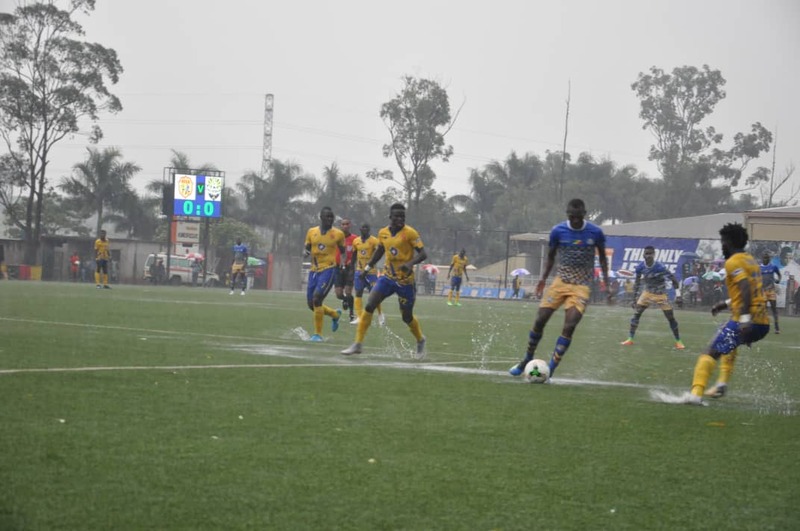 “Twenty years ago, Uganda’s national carrier, Uganda airlines would up its operations, the thinking then was that foreign airlines would fill the gap and provide the critical air services,” the Minister said. However, the government has realised that foreign airlines are not fully dependable and has therefore cautiously decided to revive the national airlines, Ntege said. She said the choice of Bombardier CRJ900s for the regional network was as a result of rigourous analysis of many competing alternatives that could serve the country’s needs. The Minister who described Uganda as a country of amazing beauty with great potential for tourism, said reliable air services are critical for its full exploitation given the fact that it is landlocked. Reliable air services will also facilitate trade especially exportation of her high value agricultural products, she added. She said the historic event of receiving the country’s first aircrafts is the beginning of collaborative mutual relationship to enhance the social and economic aspirations of Uganda and strategic objective of developing a sustainable aviation industry that contributes to the economic development of the country. 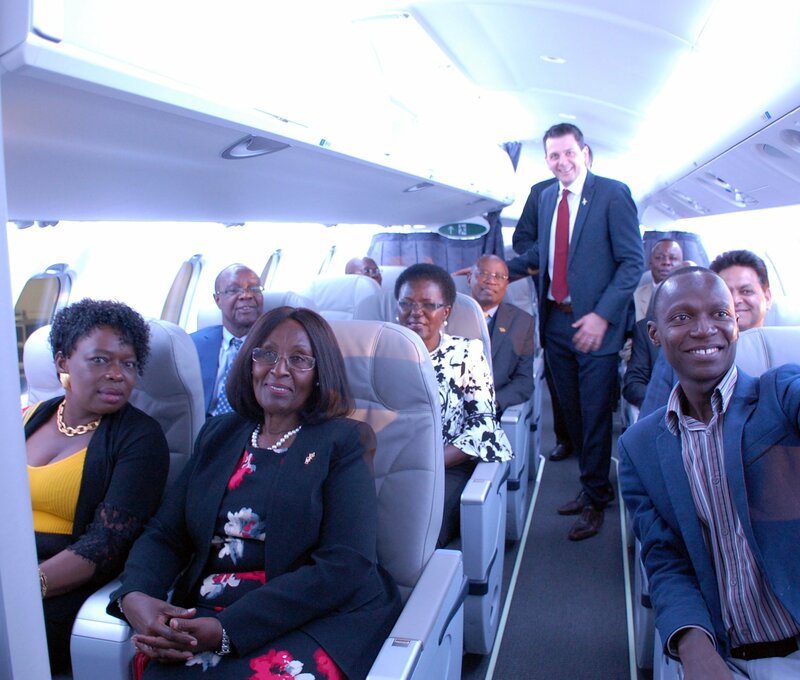 Ntege said Uganda expects continuous support from Bombardier to ensure good performance and continuing airworthiness of the purchased aircrafts. “Uganda enjoys good and stable governance to sustain high growth rate of GDP and full economic liberalization. It is an attractive destination for foreign and indigenous investors. So these factors coupled with the growing number of air passengers are a firm foundation for the growth and expansion if Uganda airlines,” she said. On his part, Fred Cromer, the President of Commercial Aircrafts at Bombardier Inc. said the CRJ900s represent cost efficiency, profitability and network flexibility. 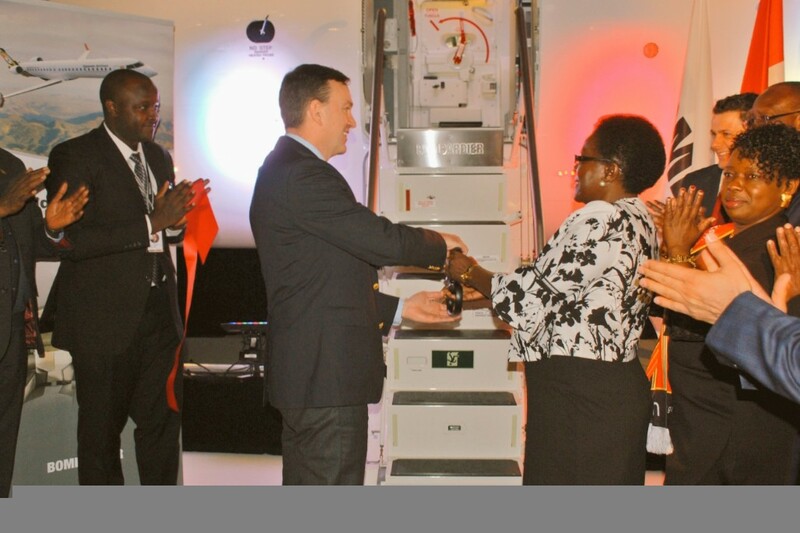 “We are confident the CRJ will contribute to Uganda’s economic growth and success. Since it’s launch, the series has led to the development of regional markets around the world,” Cromer said. 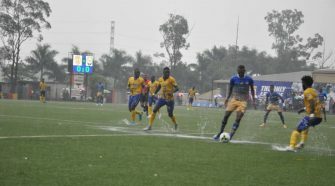 “We congratulate Uganda Airlines. We are honored to celebrate this with you. Thank you for trusting us and let us make this the start of a great partnership,” he concluded. The received jetliners are branded ‘Uganda Airlines’ with a tagline ‘Fly the crane to the Pearl of Africa’. 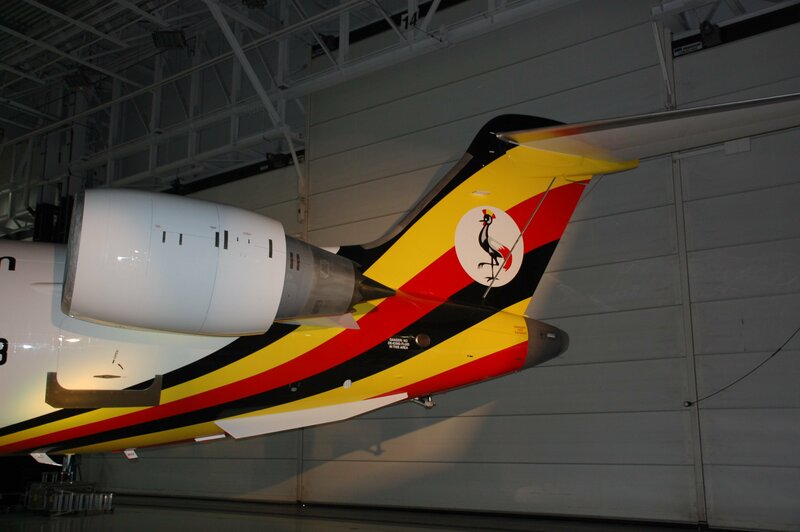 Their verticle stabilizer, rudder and part of their hind lower fuselage is designed with the Uganda flag colours and a crested crane. The aircrafts are expected to touch down at Entebbe International Airport on April 23 but will not immediately start commercial flights until they complete the Air Operator Certification (AOC) process. The AOC process has five phases and according to minister Ntege, it will take approximately 90 days to complete setting the timeline for start of commercial operations to be July 2019. The jetliners will on commencement of operations, will be flying in the regional routes beginning with the East African Community. Recently, Uganda Airlines announced that the initial destinations will include Lusaka, Khartoum, Kinshasha, Nairobi, Mombasa, Goma, Zanzibar, Dar es Salam, Harare, Mogadishu, Kigali, Kilimanjaro, Addis Ababa and later Accra band Johannesburg.